When hearing about a game trying out to condense what could be called a banquet of 13 console games into a single bite-size experience, I don't think it's strange that my initial impression on Final Fantasy Record Keeper was that it was trying to do too much with a small, handheld experience. This was until it's strategical battles and loot collecting system slyly pulled me into an addictive state and kept me hooked with constant new dungeons to play and it never asking me to pay for the app. 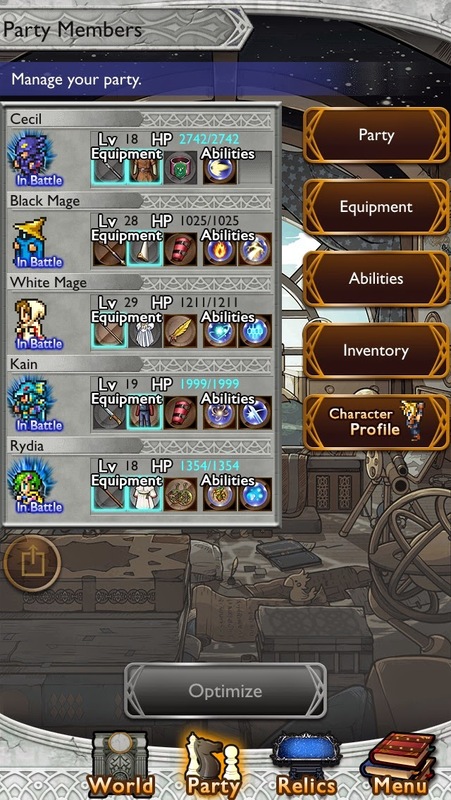 Final Fantasy Record Keeper may not be an experience with the same breadth of a console game, but as a sucker for rare collectibles and RPGs battle systems, it's a nice substitute for when I'm on the go at the price I like to pay most - nothing. 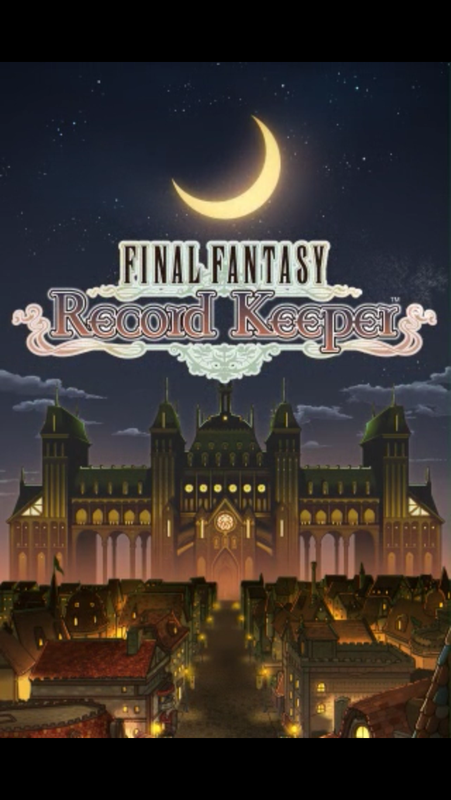 Record Keeper begins with what could be described as a throwaway story premise comprised of something about a museum, a Moogle and a boy needing to dungeon crawl to restore said museum in order to save the world (seriously). Despite this, I'm happy to say the game's 8-bit dungeons are not to be tossed aside. As a miniature version of the original Final Fantasy battle system, Record Keeper's battles see your team of five characters taking turns to attack, defend or use one of two abilities to defeat enemies and bosses from previous Final Fantasy games. Partnered with the familiar Active Time Battle system that is featured in some of the main Final Fantasy games (Final Fantasy IX comes to mind), the battle system is easy to understand and each battle is short and sweet, usually lasting just a few minutes. With so few options and easy to use touch screen mechanics, this makes it easy to concentrate on enemy weaknesses and finding the right strategy to win and getting the highest score in each battle. Record Keeper thrives with many different enemies and strategies that are reminiscent of Final Fantasy games of yonder and even if you haven't played every Final Fantasy game, every boss is varied in ways that are fun to figure out for the first time. 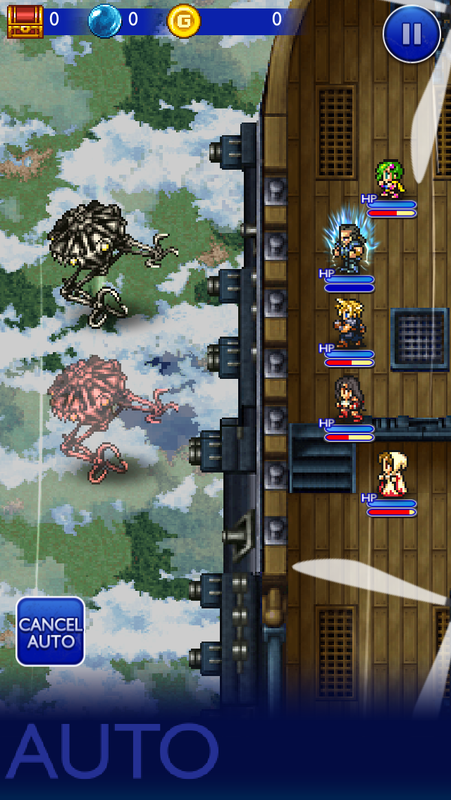 Along with working out strategies for unfamiliar bosses, I found it equally as satisfying to recognise enemy strategies being incorporated from some of my favourite Final Fantasy games. When in the Final Fantasy X dungeon Sinspawn began using Demi on my party, I remembered the wasn't going to kill me immediately, but realised that the Sinscales could knock out my party quickly, so I changed my strategy accordingly. Record Keeper rewards players for exploiting the right weaknesses with a rank from 1 to 3 chocobos decided by how well you did in each battle, with 3 chocobos being the best and giving you double experience and better loot so it definitely pays to know how to handle each boss. With a choice between classic and elite dungeons, even from the initial install, Final Fantasy Record Keeper has enough regular content to keep players busy for awhile. On top of this, there's plenty of replayability to be found in the game's daily and limited weekly events, giving players chances to win hard to find upgrade materials and gil in daily events along with new characters and rare items lurking within the depths of the event dungeons that are usually added on a weekly basis. The best part about these events is that they almost always include different difficulty settings so that all players can find enjoyment in these challenging settings. I found myself striving to finish each weekly dungeon to the highest rating as fast as I could so that I could begin preparing for the next one. 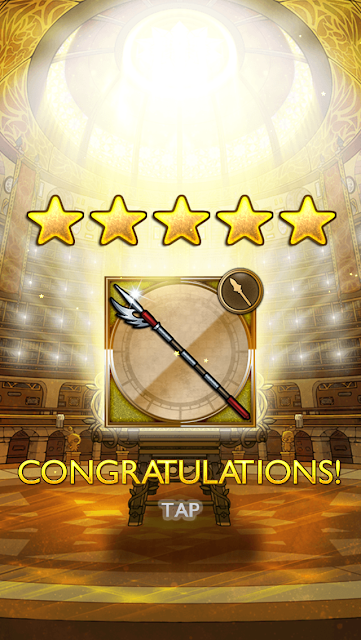 The satisfaction of getting new characters and seeing my weapons giving me a totally new edge in battle kept me so busy that the only thing keeping me from spending days on the game and cutting off contact to the outside world was the stamina bar that depletes everytime you enter a dungeon, which I almost become thankful for. On the topic of the stamina bar, Record Keeper does have in-game purchases in the form of an in-game currency called Gems. These Gems allow you to do things such as recharge your stamina instead of waiting for it to recharge over time, add more item slots to hold weapons and abilities or having a chance at winning a 3-5 star weapon in the Rare Relic Draw. But here's the thing – I never needed any Gems, because the game's alternate currency of Mythrils can be used instead of Gems. Since Mythrils are usually won by completing battles in main and event dungeons, I've never felt the need to buy any Gems and the game has never tried to push their existence upon me. Rather, the game takes an approach I think all games should by letting you enjoy the game to it's full potential, but if you want more chance of getting better equipment and less time waiting for stamina, you have the option to pay. As I've said, I haven't put a single cent into the game, but may do so in the future purely because I like the game so much. Although it doesn't replace the stories or large immersive worlds that RPGs are known for, Final Fantasy Record Keeper is a free and good alternative for on the go that has a fair payment model along with hours of free gameplay to keep player's of every budget busy for hours. I love opening the app, turning down Record Keeper's soundtrack of original Final Fantasy tracks just low enough so I can hear any podcast I'm listening to while playing a fun miniature dungeon crawler that is strategical enough to keep me logging in daily and trying to get all of the relics for my favourite characters (And goddammit, someday I'll figure out right strategy to take down Forza from the Final Fantasy V dungeon). With a wealth of replayability, bosses, collectibles and dungeon varieties, I'd say Record Keeper is a quality addition to any RPG player's smartphone and a great reminder of the original Final Fantasy games. Honestly, I'd still be playing it instead of writing this review if I hadn't broken my phone last week. Final Fantasy Record Keeper can be downloaded for free from the App Store if you have an iPhone or iPad or the Google Play store if you are an Android smartphone user. Thanks for reading! What did you think of Final Fantasy Record Keeper? Does it make you want to go back the old Final Fantasy games? Note: Smartphone games are regularly updated and changed. My opinions about this game are based on the condition of the game at the time this review was released and may not cover any future important changes to the app. Thank you for understanding!